I should have known what I was getting myself into when I put xiao long bao ("soup dumplings") on the menu for a dinner party. This dish (in addition to the Silken tofu with mentsuyu and chili oil) is inspired by Corey Lee of Benu restaurant. All the ties to Benu are quite deliberate: Corey Lee is one of my biggest inspirations and all of my guests have had the fortune of eating at Benu, and thus I wanted to serve dishes that would evoke that common thread. 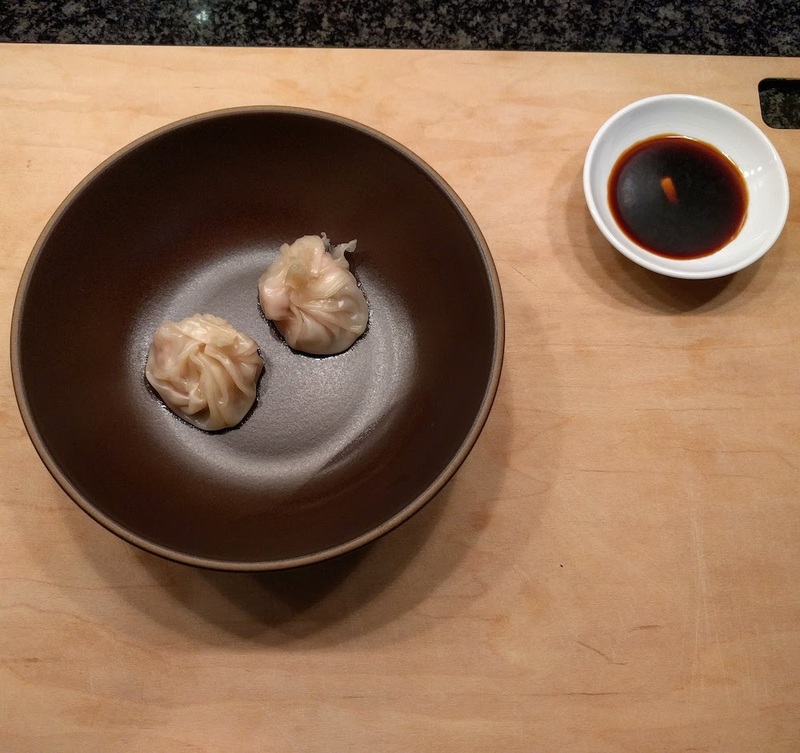 That said, I find xiao long bao unbelievably difficult to prepare properly and it's a small miracle I found these even acceptable during the main event. If you've never had a soup dumpling, it's quite literally what it sounds like: a small pleated dumpling that bursts with hot liquid soup when you eat it. It may seem a mystery how you get liquid inside of a dumpling, but put your syringes away; the secret is to set the soup stock into a jelly of sorts with gelatin, which then melts when steamed and served. You'll read that the way to eat a soup dumpling is to pierce it and drink the soup from a large spoon before eating the dumpling (and remaining meat filling), but I sort of like just eating the whole thing in one bite - they burst in a fun way. Make sure your dumplings are not scalding hot if you want to try this. This is a barely-modified version of the recipe that originally appeared on ChefSteps with Andrea Nguyen. I added shrimp to the filling on a whim (leading to a possibly confused mix of proteins), and believe it or not, used storebought dumpling wrappers instead of making my own dough. Before there are riots on the streets, I should say I have made my own dough for one practice batch, but was unable to achieve a quality I was satisfied with, so perfectly round and flat storebought wrappers it is. I served these with a dipping sauce made of black vinegar and soy which has a complex smoky/salty flavor. I had to travel far and wide to find black vinegar (at a Vietnamese market, no less) - if you can't find any, just soy sauce should be okay, but there's no easy substitute that I know of. Prepare the chinkiang vinegar sauce: combine all ingredients, mix well. Reserve in the refrigerator until needed. At least 6 hours in advance, prepare the soup: slice the ginger into small rounds and smash with the back of your knife. Combine all ingredients except gelatin in a pot and bring to boil; reduce by about half. Strain the soup, and cool for at least 15 minutes. Bloom the gelatin in cold water for at least 5 minutes. Melt the gelatin into the soup, stir well, and transfer to a quarter sheet pan and chill in the refrigerator. Gelatin takes many hours to set properly, so plan accordingly. I've pulled it too early, and ended up with a very wobbly jelly that is nearly impossible to work with properly. Prepare the filling: combine all ingredients in a food processor and pulse until combined well. Transfer to a bowl and reserve in the refrigerator until ready to assemble. Finely chop the set soup jelly. At this point you can add the jellies directly to the meat mix, but I chose to keep them separate. To assemble: brush a wet fingertip around the edge of a dumpling wrapper. Add about a tablespoon of pork filling to the center, and top with a few of the soup jellies. Watch the ChefSteps video on repeat to learn the pleating technique (I certainly haven't mastered it yet). Repeat until out of filling or you have the desired number of dumplings (the fillings can be kept separately for 1 day in the refrigerator). To serve: steam the dumplings on parchment paper for 9 minutes. Carefully add two dumplings to each bowl and serve with chopsticks and the black vinegar sauce.